Over the past few days we have reflected on Gabriel Possenti’s vocation, as well as some of the virtues that helped him to live that call from God to the fullest. Today we turn to the most important moment of his life: his entrance into eternity. For a long time Confrater Gabriel had been suffering with the dreaded disease of tuberculosis, growing weaker and weaker every day, until he could no longer leave his bed or even wear the rough fabric of his beloved Passionist habit. His faithful mentor, Fr. Norbert, was keeping watch with him. Of course, there was someone else in that room – someone who, though invisible, was making a last-ditch effort to shake this heroic young man’s virtue. At least three different times, Gabriel experienced temptations so sudden and violent that it was immediately clear that they had come from the Prince of Darkness himself. With the help of Fr. Norbert’s blessing and Gabriel’s own fervent prayer, however, the assaults passed and left the dying Brother in peace. Despite his difficulty in breathing, Gabriel was able to say several short prayers, among them a heartfelt aspiration to Our Lady: “My Mother, make haste!” He was unable to finish his final prayer vocally, but he gave a far more eloquent testimony to his fellow Religious who had gathered at his bedside. At the moment of death, he seemed aglow with joy, glimpsing the Blessed Mother whom he had loved so much in life coming to lead him to Heaven. He then breathed forth his soul in peace. 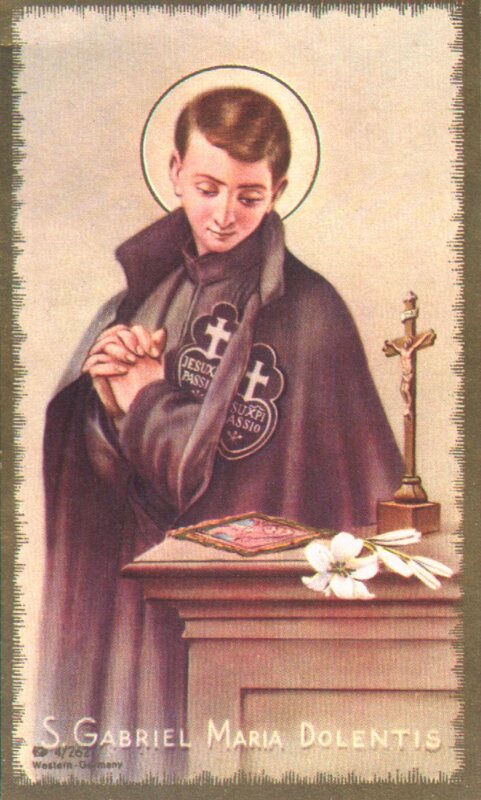 O good St. Gabriel of the Sorrowful Virgin, you were taught by God to love the Passion of Jesus and to remember the Sorrows of Mary His Mother. By her side, you stood by the Cross of Jesus and shared her compassion. Following her, you grew in love for God and all His people. O St. Gabriel of the Sorrowful Virgin, we humbly ask you to intercede before God on our behalf, especially for the intentions we now present before you. We place our trust in your prayers St. Gabriel and wish to follow your example. Remember us, and especially our youth, with compassion. Support us all our days by your holy prayers. And when this life is done, may we join you in heaven in the company of Jesus and Mary. Amen!